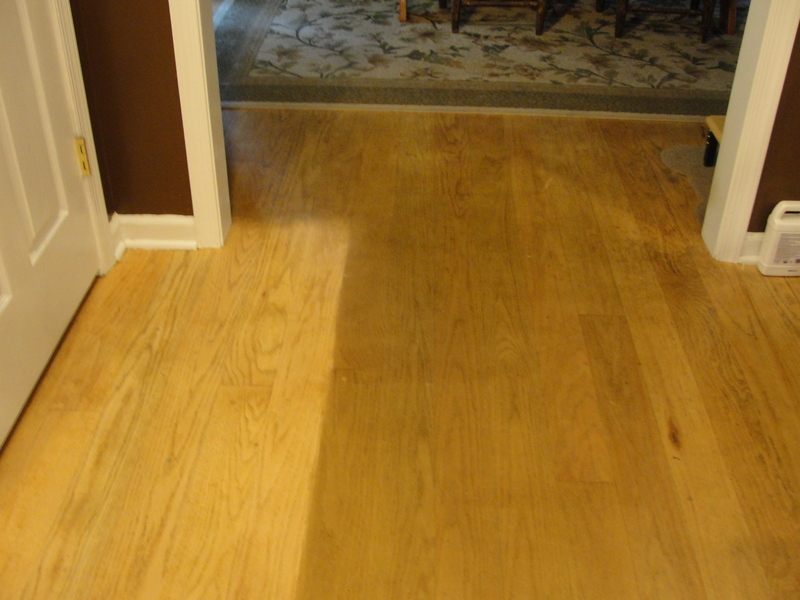 After years of cleaning her oak floors with products such as Mop & Glo, Crystal’s floors had a grayish-green tint to them and never looked clean. Researching what to do without having to completely sand them down and have them refinished, she found that AMMONIA would do the trick. Warning: Be careful. Use ammonia in a well-ventilated area, as the fumes are awful, and do not let it sit too long on the wood or it will darken it. How she did it: Put ammonia into a spray bottle. Spray on floor in a 2×2′ section. Let sit about 30-60 seconds. Using a plastic putty knife, gently scrape the old floor “cleaner” build-up off the floor. Immediately wipe up with paper towels, or if it’s sitting on the putty knife, put in wastebasket. Wipe floor with clean water and move to next section. If necessary, repeat in sections that are tougher. While it’s very time-consuming, it’s not hard. Work one section at a time, and don’t ever use those cleaners again on wood floors.